KRUEN – Group of Seven leaders agreed on Monday to wean their economies off carbon fuels and supported a global goal for reducing greenhouse gas emissions, but they stopped short of agreeing their own immediate binding targets. In a communique issued after their two-day summit in Bavaria, the G7 leaders said they backed reducing global greenhouse gas emissions at the upper end of a range of 40 to 70 percent by 2050, using 2010 as a basis. The range was recommended by the IPCC, the United Nations’ climate-change panel. “We commit to doing our part to achieve a low-carbon global economy in the long-term, including developing and deploying innovative technologies striving for a transformation of the energy sectors by 2050, and invite all countries to join us in this endeavour,” the communique read. 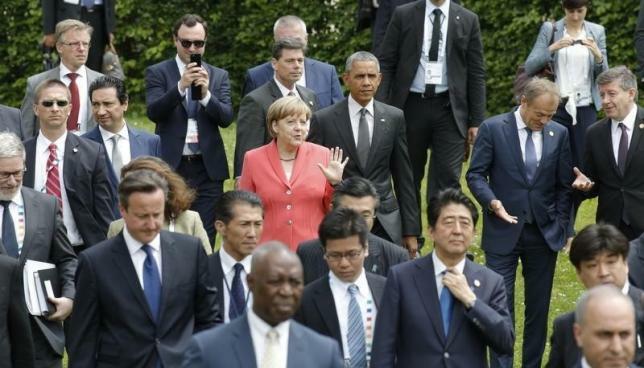 G7 host Angela Merkel of Germany, once dubbed the “climate chancellor”, hoped to revitalise her green credentials by getting the G7 nations to agree specific emissions goals ahead of a larger year-end United Nations climate meeting in Paris. “We are also ready, should the situation escalate, which we don’t want, to strengthen sanctions if the situation makes that necessary, but we believe we should do everything to move forward the political process of Minsk,” Merkel told a final news conference of a two-day G7 summit in Bavaria. The leaders discussed the Greek debt crisis as a group and also in bilateral meetings during the summit at the foot of Germany’s highest mountain, the Zugspitze. “We want Greece to remain part of the euro zone but we take the clear position that solidarity with Greece requires that Greece makes proposals and implements reforms,” she said. “There isn’t much time left. Everyone is working intensively. The day after tomorrow there will be opportunity to discuss it with the Greek prime minister. Every day counts now,” she said.